Spacious detached villa. 3 double bedrooms Close to Coral Bay strip and beach. The bungalow has three spacious double bedrooms all air conditioned, the master bedroom being ensuite. There is also an additional bathroom. Open plan living is enjoyed, with fully fitted kitchen, dishwasher, cooker, microwave and large fridge. There is ample outside space with good sized gardens all round for sunbathing and barbecues. Patio doors open from two of the bedrooms on to the garden and two further patio doors open onto the spacious patio area for sunbathing and eating alfresco. A pagoda provides shade. There is also a roof terrace with extensive views of the sea and the mountains. The property also offers a fully equipped kitchen with a washing machine, microwave, fridge and dishwasher. Towels and bed linen are provided for your convenience. 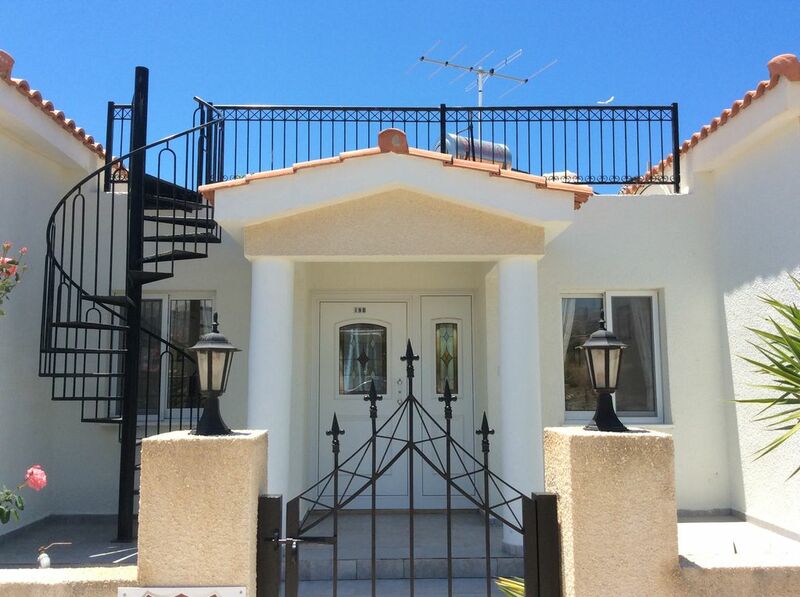 The property is ideally situated for public transport along the Tomb of the Kings Rd to Paphos harbour. A busy supermarket is 6 minutes walk away and Coral Bay strip which is packed with bars and restaurants is 10 minutes walk. The lovely sandy beach of Coral Bay is only a 15 minute walk away or a three minute drive. Another popular and very safe beach for children is Coralia beach about a 5 minute drive from the villa. A car is not essential but for trips inland or places like Latchi, for example, or general exploration of the island a hire car is advisable. There are many hire car services locally and from Paphos airport. There are many taxi firms locally as well. It is in a great location, near to everything needed for a great holiday-swimming, walking, fishing, going to bars and restaurants without needing a car. Super market and bus route to town of Paphos are all nearby. The house is very comfortable too with a quiet garden and lovely shrubs-pick a lemon or orange off the tree for drinks! One bathroom is ensuite to the master bedroom. It has a shower over the bath. The main bathroom has a shower over the bath. Please do not put toilet paper down the toilets. Coral Bay beach 3 minutes drive away. Lovely sandy beach with beach bar at both ends and sun beds and umbrellas. Coralia Beach 5 minutes drive away. Lovely sandy beach perfect for children. Sunbeds. Sheets, duvets and pillows are provided. Washing machine Washing line and airer as well. Ample parking on driveway and front of house. Yes and wifi. Will leave details in the house. Settees and TV in open plan living area. Very spacious. There is a calor gas hob. If the gas runs out the gas bottle can be easily changed. (Purchased cheaply from the garage up the road or Phillipos's supermarket nearby). Feel free to use what is there. Plenty of everything you will need. (Inventory completed). See instructions for TV, movies and sport. Good choice of novels etc on bookcase. Spacious garden to all four sides. There are fruit trees to one side, lovely shrubs and flowers to three sides. Hose pipe, useful for getting sand off your feet or cooling off on a hot day! There is a sun roof with views of the sea to the back and the mountains to the front. Boat trips and hire available at beach, just 5 min drive or 10 min walk. Lovely big veranda looking onto garden fully planted. Diving can be arranged locally. There are gold courses within 30 min drive and a driving range about 10 mins drive. Lovely, homely property in ideal location for beach, buses, bars and restaurants. We enjoied with our family to spend holiday in this beautiful place. Near the beach and shops. Property was in a very good location.Was generally very clean ,although lots of the furniture and fittings were very "tired".Cutlery could have been much better. Thanks for the review, Joe. We inherited the villa from my parents and intend to replace furniture and generally update the property in the near future. Feel free to come again! interresting sites (Pafos, Polis, Latsi). Finding the address may be difficult because of the cypriotic notation. We have had a great time!! A short 10 min drive along the coast is the Akamas peninsular, great for walking and bird watching. Another five minute drive up the coast there is the St George's area, with ancient archiological site and bay/fishing boats with a restaurant. Between these is sea caves with a ship wreck to see and caves in the rocks and walking site and a very good restaurant/ bar.